The Holy Mount or the Mount Athos has about 50 Km length, 8 to 12 Km width and it covers a surface of about 350 square kilometers. The borders of the monasterial city are set on the ground by an imaginary line that begins from the location “Fragokastro” on the West coast and reaches the cape “Arapis” on the opposite side. The natural beauty of the peninsula is wonderful. The Mount Athos that dominates there is an enormous cone of 2.033 meters height. It’s bare top that seems to be piercing the sky and its slopes, which are full of old evergreens, give the area a unique natural beauty. Any Greek or foreign Orthodox Christian who wishes to visit Mount Athos must first get in touch with the Pilgrim Bureau in Thessaloniki (tel. (++30) 2310 833 733) or Ouranoupoli, Halkidiki (tel. (++30) 23770 71 423) in order to obtain the Diamoneterion (visitation permit) which is valid for four calendar days. Foreigners of other religious affiliations must apply to the Ministry of Foreign Affairs, Directorate of Churches, 2, Zalokosta St, Athens, (tel. (+30) 210 362 6894) or the Ministry of Macedonia and Thrace, Directorate of Political Affairs, Plateia Diikitiriou, Thessaloniki, (tel. 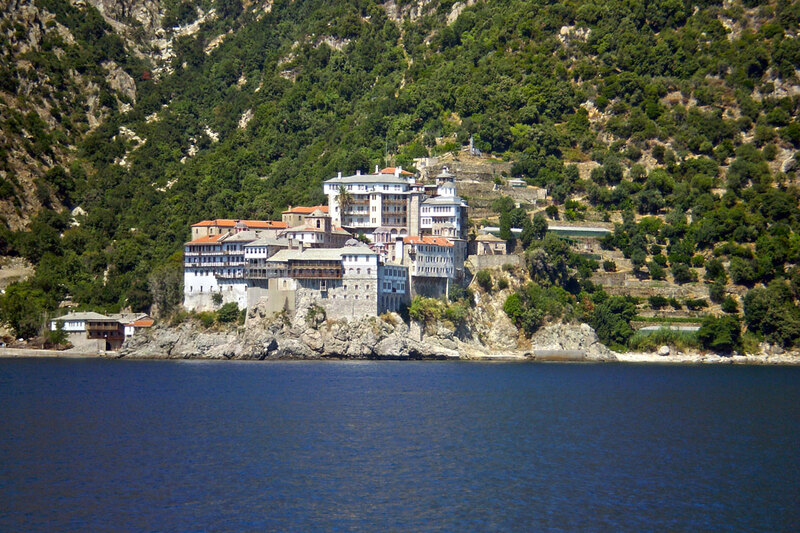 (+30) 2310 270 092) in order to obtain an entry permit for Mount Athos. Also daily cruises take place from Ormos Panagias to Mount Athos. A tour around the Mount Athos for everyone.